The Broom armada brought the River Yare to a standstill on Saturday as the largest single gathering of Broom Boats prepared to form up according to the age of each boat. The honour of leading the sail past fell to the 26ft Broads sailing yacht Bessie Bell, which was built for the company’s hire fleet in 1911, but there were lots of classic motorcruisers on show, too. Once the fleet assembled slightly downstream of Coldham Hall they headed towards Broom’s Brundall yard and then on to Surlingham Broad before dispersing on the River Yare by Coldham Hall. On Wednesday 31 July at 9.30am, Trafalgar Square will host the official unveiling and naming of Great Britain’s yacht for the Clipper 2013-14 Round the World Race. ‘Moored’ alongside one of London’s most famous landmarks, Nelson’s Column, and measuring an impressive 70ft, she won’t be hard to miss. She will remain there until Sunday evening 4 August, providing a rare opportunity for race enthusiasts to view the new Clipper 70 out of the water. The ninth edition of the Clipper Round the World Yacht Race 2013-14 starts Sunday 1 September from St Katharine Docks, London and is anticipated to be the biggest event in the race history. More than 650 people will represent more than 40 different nations on 12 brand new 70ft racing yachts designed by renowned naval architect Tony Castro, and will return almost a year later after completing the 40,000 miles route. In other Clipper news, PSP has been appointed as the official logistics partner of the 2013-14 event for the third consecutive time. 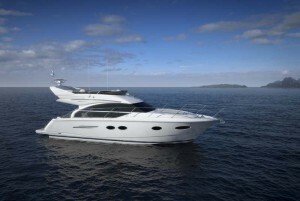 Successor to the popular Princess 42 will launch at the 2013 Southampton Boat Show – Is this the best kept secret in the world of motorboats? MBM has learned that Princess will be launching a replacement for its all-conquering 42 flybridge at this year’s Southampton Boat Show. Sam Goodchild has become the highest-ranking British skipper in the Solitaire du Figaro since the race went one-design in 1991. Finishing leg 4 in 13th, the Shelterbox skipper finished the 1,938 mile race in 11th overall – an accumulated elapsed time of 10 days, 7 hours, 59 minutes and 42 seconds – two hours, 31 minutes and 19 seconds behind race winner Yann Elies. Making his way into the dock shortly after Sam, Magma Structures skipper Nick Cherry finished the 520-mile Leg 4 in 16th in a time of 2 days, 10 hours, 48 minutes and 58 seconds. Nick’s consistently solid results in the teens over the four stages of the race tonight saw him finish 17th overall – an eight position improvement on his 2012 Solitaire result. 22-year old Artemis Offshore Academy sailor Jack Bouttell (left) crossed the Leg 4 finish line in 21st, putting him 21st in the overall rankings and first in the Solitaire du Figaro (first timer’s) Rookie division. In winning, Jack has become the first ever British skipper to stand on the top of the Rookie podium. A British grandmother has become the oldest woman to sail solo around the world non-stop – at the third attempt. Intrepid Jeanne Socrates, 70, from Ealing, west London, set off on her mammoth journey from Victoria in Canada, in October last year. She sold her family home to take up the gruelling challenge after the death of her husband, with whom she learned to sail in her 50s. The former maths teacher was skipper, navigator, engineer and chef on her 38ft yacht Nereida. It was third time lucky for determined Mrs Socrates as she failed in her previous two attempts to complete the 25,000-mile circumnavigation. Now after 259 days at sea, she has become the oldest woman to solo non-stop circumnavigate the world. The grandmother-of-three will have to wait for experts to carry out an inspection on sensors on board the boat to have her record verified. Speaking after she docked in Victoria, Canada, in the early hours of Monday, she said her achievement was a victory for the elderly. She said: ‘I am the oldest by a long shot. Who else would be crazy enough to do it? ‘As soon as you mention your age and number to other people, they get very ageist. Emailing from her boat during the challenge, she said: ‘I’ve gone around [the world] several times now, so I figure it’s time to get my name on the list.